"Are the sharks dangerous? Can they bite you?" I asked, voicing the concern of the rest of the group huddled around the shoreline. Our guide Jack shook his head, laughing. "No, no. Not dangerous. They only babies. Very small teeth." He dug into his bucket and tossed another handful of food into the clear water a few feet from where we stood. Immediately the water boiled. We all watched in amazement as a large school of assorted fish, including a dozen or so small black tip reef sharks, converged on the feed. 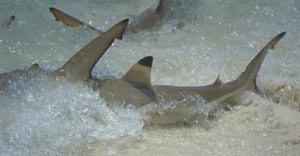 The hungry sharks, wrestling and snapping at each other as they fought for a share, edged closer to the sandy shoreline. "Watch your toes!" Jack warned, grinning. He mimicked an opening and closing mouth with his hand. We all took a collective step back out of the ankle deep water and onto the safety of the clean yellow sand. "I thought you said they were safe!" I protested as a shark a meter long made its way up onto the beach, thrashed around for a bit, then re-entered the water. "Very safe," Jack agreed. "Hardly ever bite people anymore." We hastily took another step back, but we were all smiling. This exciting attraction was an unexpected and welcome addition to what was already shaping up to be a memorable trip to Palau Payar. 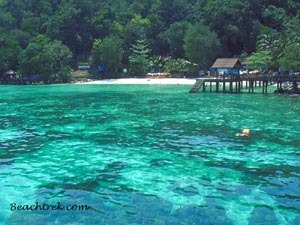 Pulau is the Malaysian word for island. There are no less than seventy pulau's surrounding the waters of Langkawi (itself a large palau) off the Northwest coast of Malaysia. Most of these islands are small and Payar Island, thirty kilometres south of Langkawi, is no exception, measuring less than five hundred meters across. You can book a day tour to Payar from your hotel tour desk on Langkawi, but it pays to read the brochures because there are large differences between the services offered by the various tour operations. This shark was a little too anxious to get to know us. The group I choose offered beach access and a budget lunch (not to mention baby shark feeding), the price 85 ringgit plus 50 ringgit for two scuba dives. The trip from Langkawi took a comfortable forty-five minutes by ferry. During the voyage our guides introduced themselves, explained to us our options for the day, and gave us some interesting information about our destination. 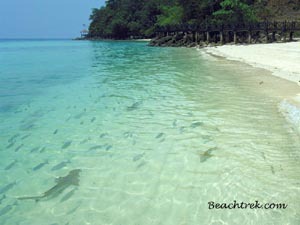 Payar Island, they told us, is a strictly enforced marine reserve with no fishing or collecting of any kind allowed. 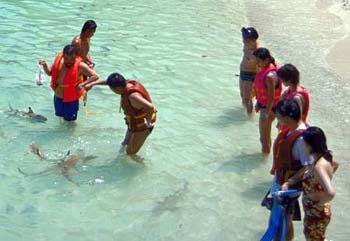 Because of this, the island is one of the prime scuba diving sites of the area and the fish are all very friendly. You should not try to touch the fish though, they said, as sometimes they don't know the difference between what is food and what are fingers! They went on to describe the various options available. Certified divers were invited on a boat dive to the eastern tip of the Island. Non-divers could snorkel, sunbake or go for a bush walk. They also offered a resort style dive package that included basic instruction followed by a closely supervised dive in a safe area. Soon after we docked at the pier I was bundled onto the dive boat that 'must leave now or we miss lunch', and transported out to the dive site. "How's the vis been lately?" I asked the dive guide, referring to the underwater visibility. "Been lots of rain," he offered, shrugging. Oh, I thought, slightly disappointed. Rain, especially heavy rain, tended to wash soil and rubbish off the island and into the sea, muddying it up. Oh well. I can only hope that it's better than Botany Bay was last week. Scuba tanks on, we jumped into the warm water. From the Pier looking onto the Main Beach. I was not disappointed. While the visibility underwater was not fantastic, the dramatic scenery and varied fish life more than compensated. Majestic coral fans swept in the current that fed both black and white tip reef sharks, as well as huge tuna, gropers and more species of wrasse than I could ever count. The dive was a memorable and thoroughly enjoyable experience. Lunch on the beach was a simple affair, topped off by yellow watermelon, which I found funny. "What fruit is that?" I asked. "Water melon," they replied. "But watermelon is red," I countered. "What fruit is that?" And so on. They were glad to put me back on the boat. After lunch and the ritual feeding of the sharks, I went for a short walk. I found the island to be about what you would expect from a tropical paradise; golden sandy beaches, clear fish filled waters and coconut trees swaying gently in the wind. As the day ended and we all bundled back into the ferry, I found myself sorry to be leaving so soon. I could easily spend a few more lazy afternoons lying on that beach. Main Beach- Watch your toes!